Kenya is a fantastic destination for both serious birding and amazing wildlife encounters and above all you will see some of the best scenery in Africa. I was born and brought up on the shores of Lake Baringo, a birding heaven and since then, this area has been my home. During that time I had the opportunity to become very familiar with the amazing birds and mammals that Kenya offers. At heart, I’m a birder before anything else. I strive to understand the unusual habits of birders, hoping to share this knowledge and experience with the rest of the birding community around the globe. 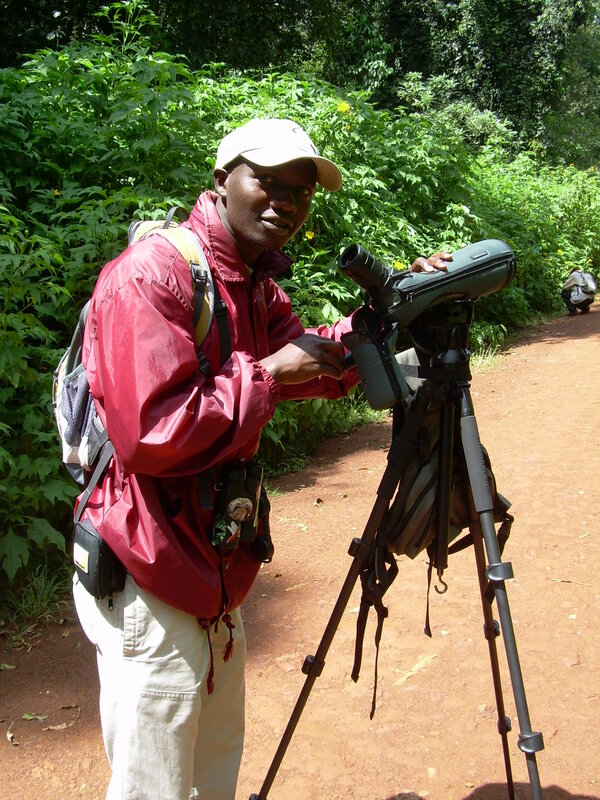 As a full time naturalist, I aim to make birding and bird watching in Kenya easily navigable, less stressful and fun. I have a life-list of 1003 species seen in Kenya, Uganda, Rwanda, Northern Tanzania Ethiopia and island of Heligoland, Germany. This blog is all about birding and bird watching in Kenya and East Africa. As a passionate ornithologist and local tour guide, this blog documents my adventures birding and shares them with others interested in Kenya’s bird life. I love to bird watch anywhere I can! I am involved with Lake Baringo Biodiversity Conservation Group and also run a local eco-tourism company, Silent Fliers of Kenya Safaris, that specializes in bird watching tours and safaris in Kenya. I completed my education at Moi University in Tourism and Wildlife Management. I’ve also completed certificates in Tour Guiding and Administration from Wildlife Clubs of Kenya and Fundamentals in Ornithology from the Elsamere Field Study Centre.I am a member of Kenya Professional Safari Guide Association with a Bronze badge. I also offer advise and assistance when planning bird-watching trips to Kenya, Uganda, Northern Tanzania and Ethiopia. Carefully formulated itineraries to suit individual needs, incorporating “birder friendly accommodation”, local bird guides, tour operations and car hire. I also encourage awareness of birds and their habitats as valuable natural resources among local communities and promoting Important Bird Areas to add value to our precious natural habitats. I am a pragmatist who amalgamates different school of thought to reach a unique blend on my views regarding wildlife conservation, natural history and climate change. I believe in living for a purpose beyond self. Hi. Thanks for “liking” my post on http://accidentalbirder.wordpress.com/. When I looked you up, I was reading this page to my husband and he stopped me when I read about Lake Baringo Biodiversity Conservation Group. He started to tell me that Lake Baringo used to be named Lake Hannington prior to post-Colonial Kenya. It was named Lake Hannington in honor of Bishop Hannington who was the first Anglican Bishop in East Africa circa the 1880s (he thinks). He and his party were massacred by order of the King of Uganda, as he wasn’t fond of Europeans. My husband’s last name is Hannington and Bishop Hannington is a distant relative of his. Interesting coincidence! (I, too, would also be a Hannington legally if I had chosen to change my name, but I’ve stuck with my maiden name.) Perhaps when we make a trip to Kenya for one of our birding adventures we shall look you up! Thank you so much for your comment which I liked it a lot. I love the pictures in your blog!! They are impressive. The Scarlet Tanager and Red-bellied Woodpecker are great shots, I however think that the Woodpecker is poorly named, unless you tell me they are diamophic? I will easily called it Scarlet-naped Woodpecker!! I like that woodpecker. Now, interesting how much you know about my home area! Actually what used to be known as Lake Hannington is Lake Bogoria, and not Lake Baringo, though the two are very close to each other that someone can easily mistake them. They are 36 km away from each other. Lake Bogoria is a purely alkaline lake while Lake Baringo is semi-alkaline. Both lakes are important bird areas, with Bogoria hosting the largest population of both Lesser and Greater flamingo. High alkalinity in its water favors the formation of blue-green algae (spirolina) which form the major diet of Lesser Flamingo. Contrary to Lake Bogoria, Baringo is a birding paradise with over 500 species ever recorded. Other than its bird life, the lake provides a home to over 300 hippos and an unknown number of Nile crocodiles. There are five species of Fish with Oreochromis niloticus baringoensis being endemic to this wetland. It is my pleasure to warmly invite the Hanningtons to go birding at Lake Hannington!!!! Cheers and have a great birding week. Thanks petrel, much appreciated .Keeping fingers crossed. Well deserved 🙂 All the best for you, the birds and your blog! Hi Joseph, thanks for stopping by my blog. I love the idea of birding in Kenya and am looking forward to reading more of your posts. I hope to get to see your fabulous fauna in person some day.